This is the last weekend to see the work of these two terrific artists, so be sure to make 23 Sandy one of your stops! Gallery visitors voted, and Jim Kazanjian received the Audience Choice Award during last November’s Shelter show. Each of Kazanjian’s images are digital “assemblages” of found photographs that have become “repurposed” building elements. Kazanjian’s work is mysterious and endlessly intriguing. Loren Nelson was our Best of Show Award winner from the Shelter show. Nelson photographs buildings encased in plastic sheaths while under construction. While awaiting their renaissance, you can almost hear these desolate buildings breath as clouds of white plastic flutter in the wind—realistic and surrealistic at the same time. Don’t miss this chance to see these unique images. Gallery hours are Thursday-Saturday, 12-6 p.m. Preview an online catalog of Loren and Jim’s work here. Roberta Lavadour has been making artist books since 1982. Her books come in all, and we do mean ALL, shapes and sizes. At, Mission Creek Press, her studio in Pendleton, Oregon, you might find Lavadour working on her own pieces, making paper, creating customized memories for someone else, or just enjoying the vast and glorious scenery of Eastern Oregon. Some of you may remember Roberta Lavadour’s work from our Maternal Legends exhibit this past December. She will also be showing three magnificent books at our upcoming The Beautiful Book exhibit in June. Each of Lavadour’s books is unique and one could not be more different from the other. Diamondback, is an amazing example of twined binding, a laborious, woven technique. According to Lavadour, “twining is a slow process–at my fastest I can twine a five inch tall book at a rate of ½ inch per hour.” Relative Memory II, a tribute of sorts to her mother, is a glass book with the image of her mother running through the spine. Once you open this book and reveal the thin glass pages, you will wonder how she accomplished this. The non-adhesive binding technique of Bliss’ Sappho is the antithesis of the twined binding of Diamondback. Lavadour opposes the original use of papyrus for Sappho’s writing by using red acetate for this piece. Inspired by the fragmented translations of Sappho’s poetry by Victorian men of the late 1800s, Lavadour presents her own take on the work of this ancient Greek lyric poet. The content and inspiration of these books will intrigue you, and the craftsmanship and technique will awe you. Roberta Lavador was recently featured on OPB’s Oregon Art Beat. Watch her video here. She has been the subject of many magazine articles and been included in numerous book art publications. The Beautiful Book: Exploring the Allure of Artist Books will open on First Friday, June 5 and run until June 27. 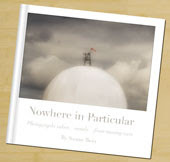 You can preview an online catalog for The Beautiful Book here. In these tough times we all need a “Plan B” and thankfully our friend Brad Rogers has come up with one that will benefit all of us. 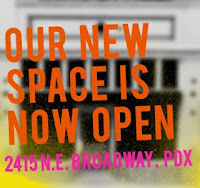 Plan B is a manifestation of our former neighboring gallery, B. Rogers Gallery, which has relocated to NE Broadway—with some great additions. Brad still exhibits monthly gallery shows, but wanted to open a store that would offer affordable art for everyone, and now there is Plan B! Brad has hand picked a special inventory of items that he says, “piqued my interest and have a unique voice.” If you’re a fan of the ordinary—made extraordinary—you’ll love Dave Meeker’s work. Meeker takes everyday materials and recreates them into objects that delight and surprise. His bowls made of plastic forks and bolted rock sculptures will make you smile. You’ll surely want to bring his work home. Nikki McFerren creates colorful, mixed media art that she refers to as “curiosities”. She also makes one-of-a–kind cards using iconic images that will be perfect for someone you know. Besides beautiful hand made greeting cards and sculpture, Plan B offers affordable paintings, unique jewelry, and much more. Next time you’re looking for a really special card or gift visit this wonderful addition to our neighborhood art scene. And, don’t forget: Brad continues to represents 25 regional artists. If you’re looking for a great fine art piece, be sure to check out the back gallery. A native of Beaverton, now residing in San Francisco, Mary Marsh brings new life to old books by using library discards to create her unique artist books. In this collection, Marsh makes new covers from old and converts checkout cards (remember those?) to pages, embellishing them with illustrations to further develop her expressions. 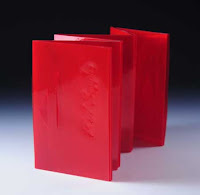 The Beautiful Book: Exploring the Allure of Artist Books will be showing in the Gallery from June 5-27, 2009. Don’t miss our First Friday artist reception on June 5, 2009, 6-9 p.m. The internet allows us so many ways to get gallery news out there these days. After trying out Facebook for a couple of months we have finally decided that it really does help spread the word. So, if want to stay in touch you can now become a fan of 23 Sandy Gallery on Facebook. We’ll post show announcements, event reminders, slide shows, calls for entries and more. Say hello while you are there. We look forward to staying in touch. The recent revolution in digital printing now makes it possible to self publish high-quality books inexpensively. At the same time, making books by hand is more popular than ever. Either way, if you’ve wanted to design your books on the computer, but need a little help getting started, this is the workshop for you. In this learn-by-doing workshop using Adobe InDesign, we’ll cover the basics of page layout, typography and preparing images for print. More information and online registration can be found here. Don’t miss this wonderful event at the Gallery on Saturday, May 9, 2009 at 5:00 p.m.
Alex Appella was born and raised is Salem, Oregon, but began writing her original poems and short stories while living on a boat in Juneau, Alaska. 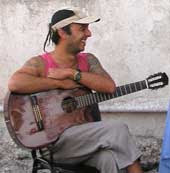 She and husband, Magú, have traveled from Alaska to Latin America sharing their music and poetry. We are thrilled to invite you to share an evening with us as Alex recites her writings and Magú sings and plays acoustic guitar. Alex is also showing an exhibit of her artist books at the Gallery. Be sure to join us for this exciting performance! Pamela Paulsrud has been beachcombing again and we are announcing the arrival her newest Touchstones to the Gallery. Fans of these lovely books will be excited about this new selection, just in time for (dare we say) “summer” in Oregon! New fans will love the smooth look and feel of Paulsrud’s Touchstones. Close your eyes, hear the surf and imagine the sand between your toes–you’re sure to feel as though you made a trip to the beach and collected your own treasures. Gallery Hours: Thursday-Saturday, Noon to 6:00 p.m. and by appointment.